이 책은 고려의 혜심(1178∼1234)이 지은 선문념송집(禪門拈訟集) 30권 가운데 설두(雪竇), 천동(天童), 환오(환悟) 3사람의 것을 뽑아 편집한 것이다. 고려의 승려 구암(龜庵)이 엮었으며, 전체 6권 중 권1이 남아있다. 닥종이에 찍은 목판본으로, 크기는 세로 26.8㎝, 가로 17㎝이다. 표지는 나중에 다시 고친 것으로 보이며, 각 장마다 정안(正安), 손창(孫昌), 유립(有立) 등 판을 새긴 사람들의 이름이 새겨져 있다. 간행 기록이 없어 정확한 연대를 알 수 없으나, 기림사 비로자나불의 복장유물(보물 제959호) 중의 하나인 선문삼가념송집 권6과 같이 만들어진 것으로 보인다. 보물 제959호에 있는 기록을 통해 고려 고종 33년(1246)에 최이(崔怡)에 의해 만들어진 판본을 바탕으로 조선 세조 10년(1464)에 간경도감(刊經都監: 세조 7년(1461) 불경을 한글로 풀이하여 간행하기 위해 설치한 기구)에서 다시 새겨 찍은 것임을 알 수 있다. A famous monk of the Goryeo Dynasty, Hyesim (1178-1234) made 30 volumes of Seonmun nyeomsongjip (Collection of Zen School’s Enlightened Verses), a collection of Buddhist literatures and discourses. Among them, Guam, another Buddhist monk of the Goryeo Dynasty, selected and edited Buddhist sermons and discourses by Seoldu, Cheondong, and Hwano to compile this book in six volumes. Out of a total of six volumes, only one remains today. 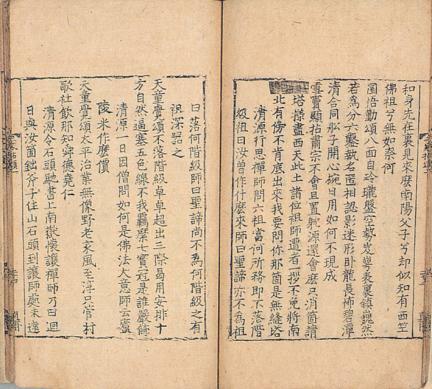 Printed on mulberry paper using woodblocks, this book measures 26.8 cm long and 17 cm wide. 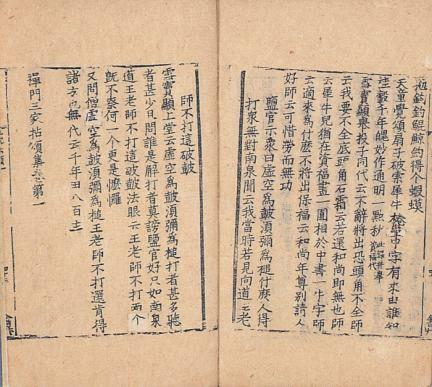 The cover seems to have been changed later on, and the names of the people who were involved in carving the woodblocks, including Jeongan, Sonchang, and Yulip, are printed on each page. Since no related document remains, the exact year of its publication is unknown. Note, however, that it is presumed to have been published at the same time as Volume 6 of Seonmun samga yeomsongjip (Book of Reciting Zen Buddhism), one of the Excavated Documents from the Clay Vairocana of Girimsa Temple, Gyeongju (Treasure No. 959). 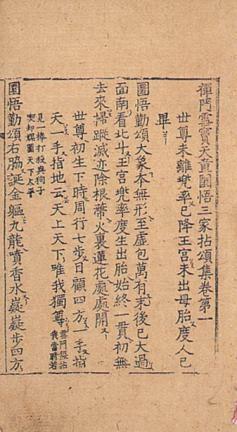 The documents from the Clay Vairocana of Girimsa Temple suggest that this book was printed again at Gangyeong Dogam (Directorate of Buddhist Publications) in 1464 (tenth year of the reign of King Sejo of the Joseon Dynasty), based on the edition published by Choe I in 1246 (33rd year of the reign of King Gojong of the Goryeo Dynasty).